Island Fox skull. Urocyon littoralis. 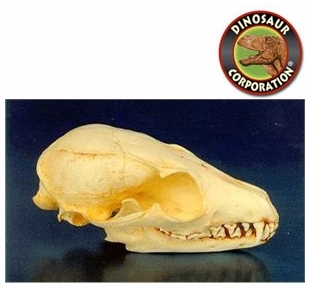 Island Fox skull replica is cast from original specimen. The Island Fox is a small fox that is native to six of the eight Channel Islands of California. It is the smallest fox species in the United States. There are six subspecies of the fox, each unique to the island it inhabits, reflecting its evolutionary history. Other names for the Island Fox include Coast Fox, Short-Tailed Fox, Island Gray Fox, Channel Islands Fox, Channel Islands Gray Fox, California Channel Island Fox and Insular Gray Fox.